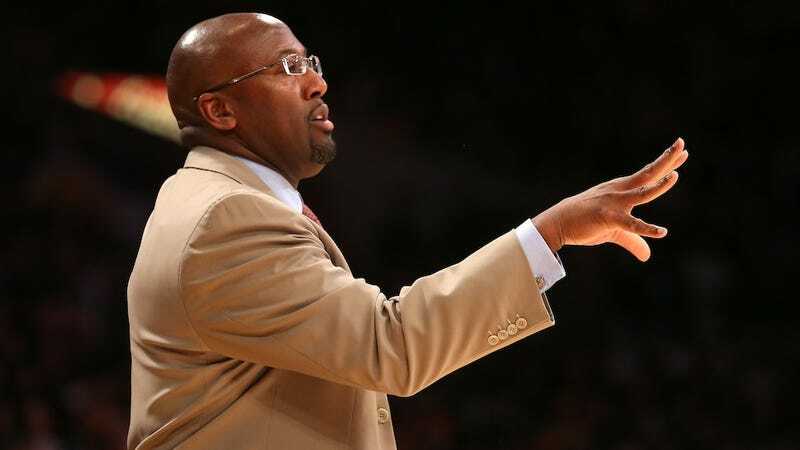 According to Yahoo's Adrian Wojnarowski, Mike Brown and the Cleveland Cavaliers are finalizing a five-year, $20 million contract that will see Brown return to the bench in the city where his head coaching career started. This comes just five months after Brown was shitcanned by the Lakers five games into this season. It's a curious move for the Cavs, as you may remember them running Brown out of town after the '09-10 season in order to up their chances of keeping LeBron James. (Remember when James was supposed to be enticed to stay by Byron Scott's fast-paced offense? That was fun.) But whatever wounds may have been created by that breakup seem to have healed, and Brown is back for the foreseeable future. That probably has something to do with the fact that the Cavs' once-stalwart defense became one of the worst in the league after Brown left town. Get ready to see lots of help-and-recover defensive schemes, Cavs fans. Of course, everyone is going to side-eye this move and claim that the Cavs just ruined their chance at getting LeBron back in 2014. Those people are dumb, because LeBron is not coming back to the Cavs. Then again, this could be all some kind of Illuminati-hatched plot that LeBron and Brown are masterminding in concert. They're always three steps ahead of us!